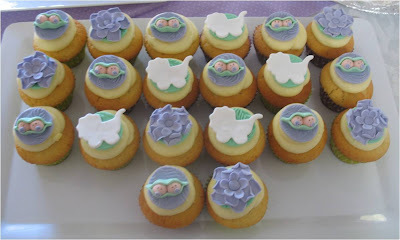 Blissfully Sweet: Tina's Baby Shower Cake & Cupcakes etc!! Tina's Baby Shower Cake & Cupcakes etc!! Finally the time had come for my sister's long awaited baby shower. I had everything pictured in mind and wanted to surprise her and go a little OTT ... how would that be a surprise??!!! For those not in the know, Amy Atlas has inspired many a stylist in her beautiful dessert buffets. I wanted to created something beautiful and called upon the Amy inside me to create my very first one! 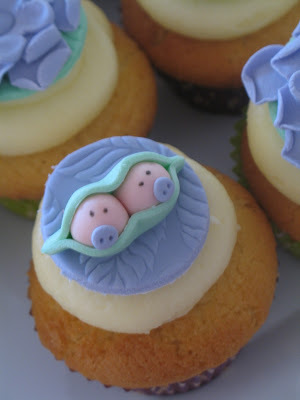 There are a few things I would do differently, but with limited time, other cake orders, 2 weeks off giving birth .... I am pretty darn happy with how everything turned out. 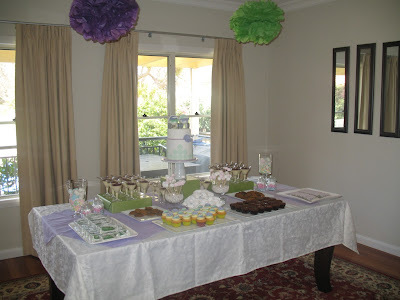 Apart from the dummy cake ..... there was marshmallow treats, lucky almonds, choc/hazelnut cookies, lemon syrup cupcakes with cream cheese icing, greek "yaya" biscuits and vanilla bean pannacotta with balsalmic strawberries. Did I say I love to cook, as well as bake??!!!! The cupcakes ... in keeping with the colour motif and overall theme of the day. 2 peas .... just like Tina's 2 little peas!! 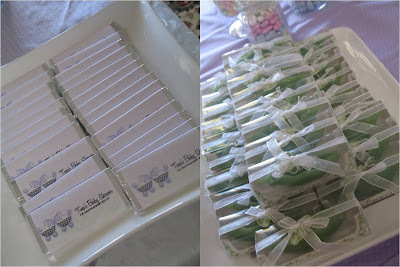 The invitations I made and sent all where in the kelly green/lilac colour scheme and all where adorned with twin prams. I wanted to carry this forward with the cake but wanted something elegant. The bottom extended tier is covered in kelly green dots and the top tier is covered in white prams. The cake is actually a fondant covered dummy. With all the desserts on offer, the thought of cutting the cake and then the obvious left overs, I thought it best to leave for decoration only. 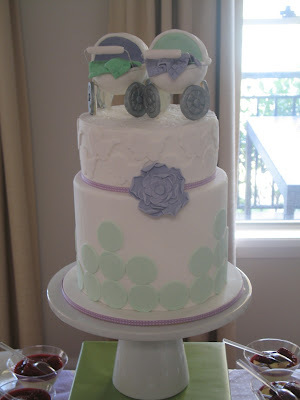 Next time I do prams on a cake, I will make sure I do the supports into the wheels a little differently - but hey - it was my cake to experiment on! The personalised chocolates that I made to match the invites (all Lindt milk chocolate) and the bomboniere - 2 peas in a pod candles. Kindly donated to me by a friend! 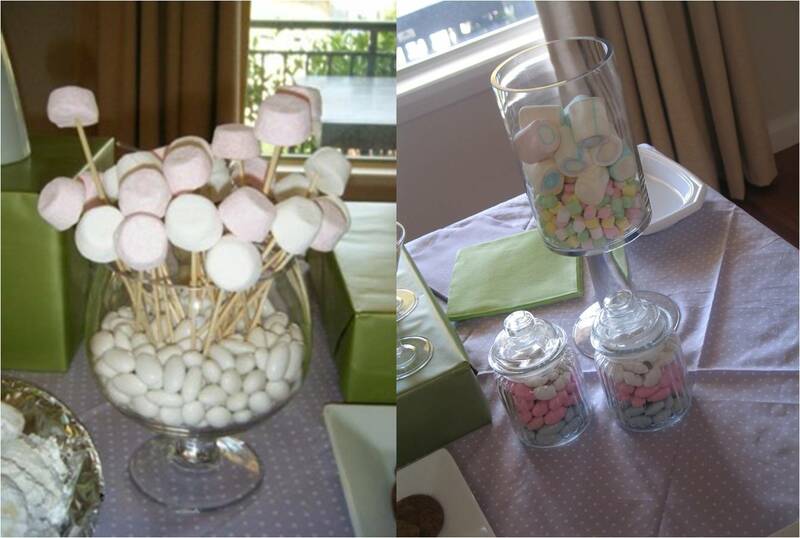 Guests were given little cellophane bags to take as many varied treats hope as they liked! Tina & I. About the only time I felt small that day - standing next to her! 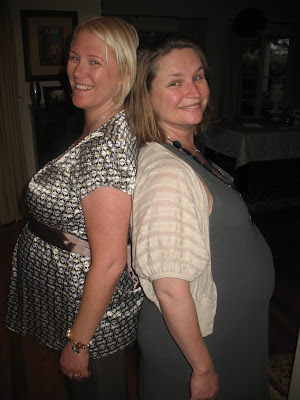 Tina (left) has 14 weeks to go and I have 2 weeks. But she is carrying twins! And how great does she look??!!! She beats me on cleavage though!! What a great day to shower my sister with baby love - a more deserving and beautiful mum to be there could not be! !